Soarin is one of the most popular attractions not only within Epcot, where you will find it housed in the land pavilion, but also within Walt Disney World as a whole. Description: Take flight as you soar over many famous California Landmarks on this family friendly attraction. You will be amazed at how real this all seems. From the scents to the sounds to the views, you will feel like you are truly hang gliding. You will be lifted up to 40 feet in the air for this ride. People with fear of heights or motions sickness may want to opt out of this attraction. 1.This is possibly one of the most popular attractions on property so lines build very quickly. Make sure to hit this ride early in the morning or within an hour of park closing. Fastpass is also a must! 2. The best seats in the house are in the front row. If are lucky enough to be put in this row your view of California will not include the other guests feet! 3. You will view places such as Yosemite, Golden Gate Bridge, Malibu, Lake Tahoe, Monterey, and Los Angeles during your flight. 4. A good suggestion is to head here first thing in the morning and obtain a fastpass then hop into line.After riding for your first time you can ride Living with the Land and eat breakfast at Sunshine Seasons before your fastpass window opens. 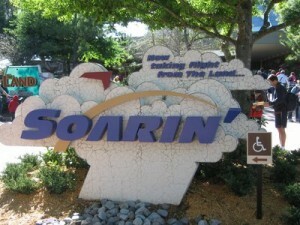 This will get you two rides on soarin before crowds start to build. This entry was posted in Attraction Spotlight, Epcot, Future World, Planning Tips, The Land Pavilion, Uncategorized and tagged Epcot, future world, ride, soarin, the land. Bookmark the permalink.